Awww, man. No super powers. No demons running amok. How long do I have to wait for the apocalypse, huh? I really don’t see how it could be that hard for Yog-Sothoth to plunge the world in unending darkness when the moon is already in front of the sun. Sigh. It’s like, why even follow the Hollow Lords Beyond if they’re not gonna pierce the realms of flesh, laying waste to the human cattle and reward their AAAAAIEEEE!!! Their damned Mark, consuming my flesh, searing their brand upon my bitter spirit! 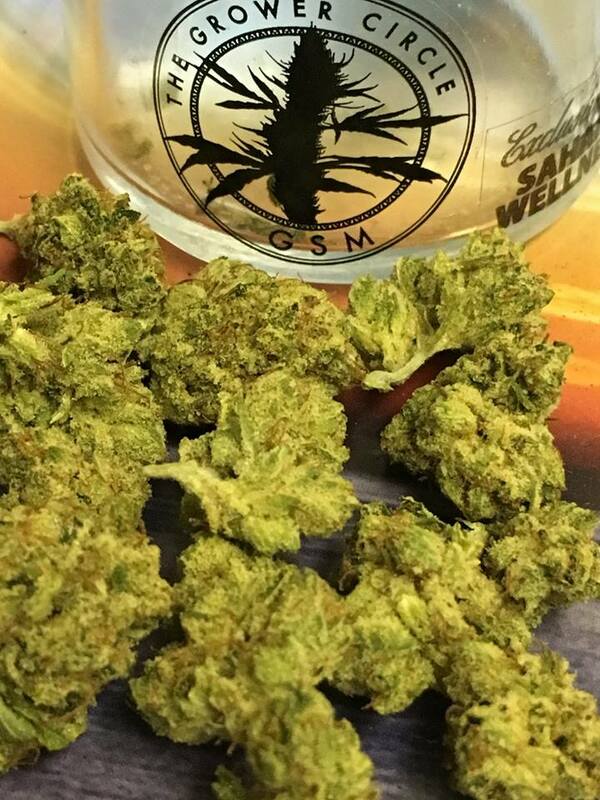 The Formless Ones Who Know Not Time demand we review The Grower’s Circle and their San Fernando Valley OG. There is no option but compliance! Sahara Wellness was a cozy dispensary located along Sahara Ave a few blocks from the Stratosphere. It was the second official day of rec sales so the line was to be expected. I chatted with the other excited tourists until we got into the main room and I was assigned a budtender. The lighting was okay, I definitely prefer brighter to peruse cannabis. The dark wooden decor is plain and pleasant. The selection of flowers was outstanding on my visit, with a deep menu at a range of price points. Of course, the Vegas market is experiencing some growing pains right now keeping their shelves stocked and prices are getting out of hand, but I expect that’ll get worked out sooner than later. So all the dispensaries in Vegas that I visited used the same kind of smell jars. It’s actually difficult to get a good whiff when there’s only a few buds in what amounts to an inch or more away from your nose. If y’all are gonna use these, I advise you fill ’em up. 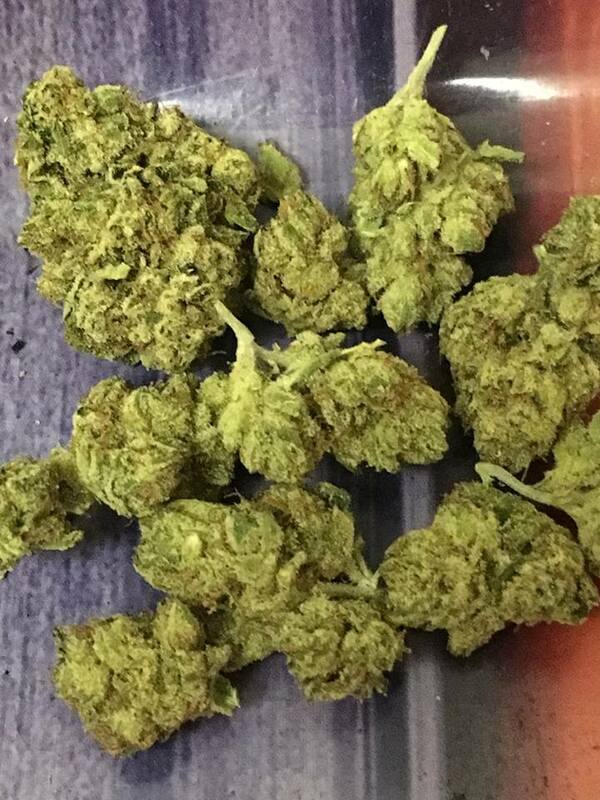 As it was, I couldn’t really be sure and just went with the nice lady’s recommendation of SFV OG, a classic cultivar that is definitely on my list to try. I got an eighth in a branded jar that says it is exclusively for Sahara Wellness. Cost $46. The concentrate selection was at a different counter, manned by a guy that admittedly didn’t know much about that 710 life. Okay, hard to fault him in that case, but there’s gotta be somebody that knows what’s up to talk to folks about these products if you’re gonna sell ’em. Or maybe not, since the selection for oil and edibles was pretty slim compared to other shops I stopped in. I just picked up a half-g of Cannavative crumble, a strain called Aphrodite that’s related to Jilly Bean. It didn’t turn me into an overnight lothario either, though I could see how the improved mood and enhanced sensory perception could lead to some babies being made. I don’t mean me! I also got a Cavi Cone, a cavair joint. While it was heady stuff, the artificial apple flavor is far too strong. I found it off-putting. Back to the Valley, ladies. The Grower’s Circle SFV OG smells like old socks. Not the worst offender I found, but there ya have it. Mmm-mmm, who doesn’t want to smoke foot sweat? The flavor is unpleasant, naturally, and the smoke irritates the roof of my mouth, but it doesn’t make me cough much. Most of the buds were small, but not quite popcorn-sized, and there was a fair amount of stemmage going around. Not cool, bro. You gotta trim unsmokable weight off the product as best you can. Plenty of pretty trichomes for the photos. I’ll say this for the buds in Vegas, it’s all been pretty potent stuff. 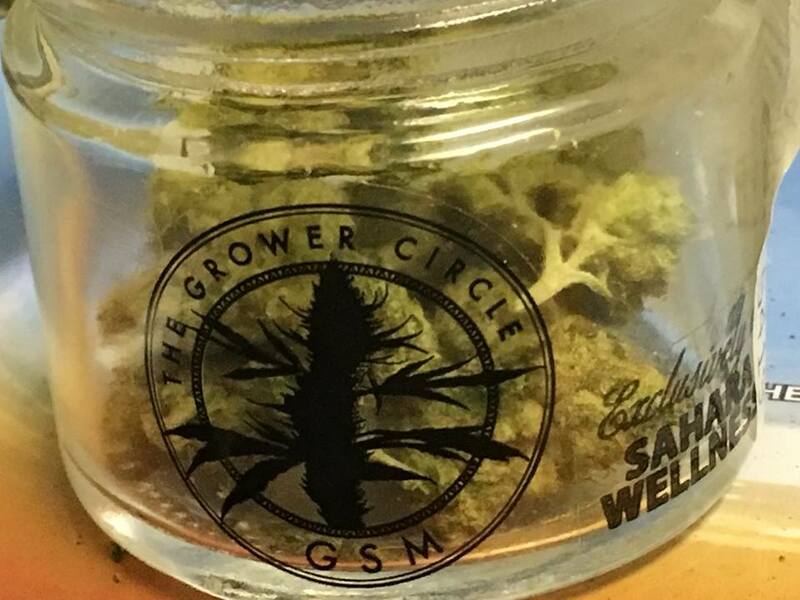 The Grower’s Circle SFV OG is no exception. It’s loud. Instead of their usual griping, my tiny brain-gremlins cease their endless chicanery and take a nap somewhere in the cerebellum’s shade, allowing Papa Smurf to get to work. Quite often I found myself putting down the SFV OG after several hits and pleasantly fugue-ing my way through the series of chores adulting requires. I might be a middle-aged divorcee but that doesn’t mean I gotta wander about Harris Teeter in a Cheeto and barbecue sauce stained shirt, having run out of food and clean and wine all at the same time, oooh, and right before this week’s episode of Depression was about to start! In the end, we’re looking at a mixed bag here (buh dum ching, tip your writers, folks). Sahara Wellness is kinda basic but nothing wrong with that. The people working there were nice if not especially knowledgable. The Grower’s Circle SFV OG stinks like dirty feet but gets the job done. I can’t recommend either to you, but saw enough from both that I’d give them another shot, though I’d only go in Sahara if I wanted flower. 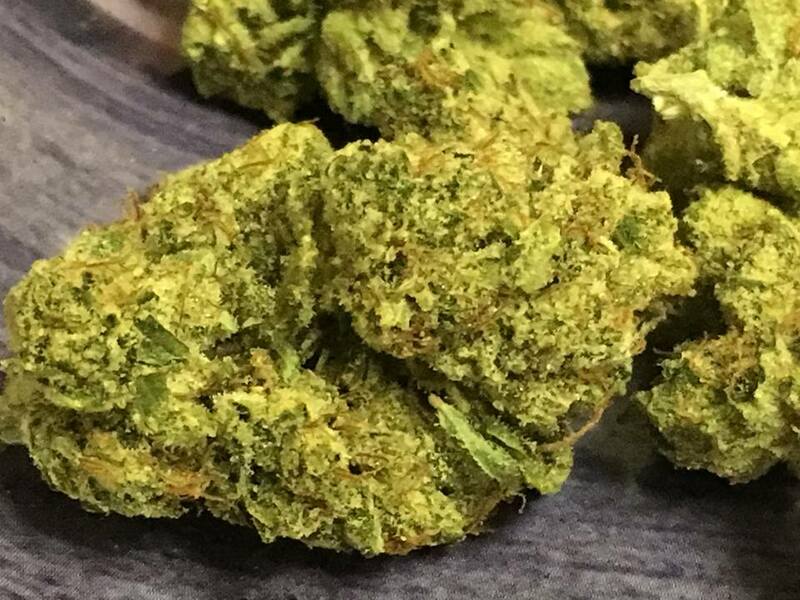 Concentrate, Dispensary, Flowers, Las Vegas, Medical, Recreational. Bookmark.